Similar to an ice chest, the Little Chiller Table allows food or drinks to be set out on display for easy access and a professional appearance. 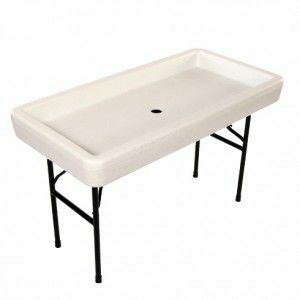 It has a tapered bottom and features a two-stage drain system, so clean up is easy! The durable steel legs lock in place to provide superior strength, but they also collapse for storage. It is great for use indoors or out, especially for grill cookouts, beach parties, and potlucks. The Little Table is designed to hold lots of ice, keeping food and beverages cold; the weight capacity is 350lbs including 35 to 50 lbs. of ice! The high-density Polyethylene material is made to withstand the heat and sunlight, as the Polyethylene is durable and chemical resistant as well as being UV inhibited. McCourt Manufacturing and Chillin' Products also offer accessories that will enhance your experience with the Fill 'N Chill Party Table and Little Chiller. You can view them on Chillin' Products' website (a division of McCourt Manufacturing). Shipping weight – 40 lbs.